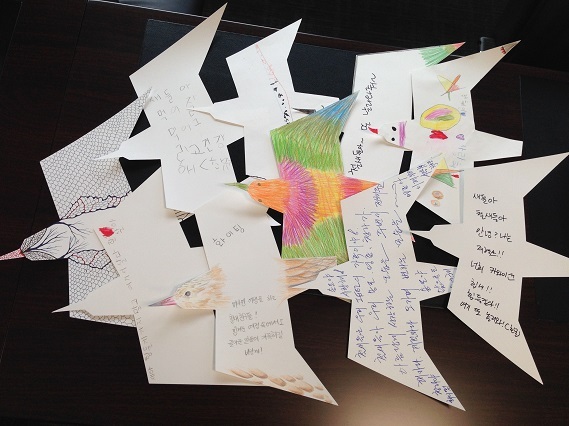 동아시아-대양주 철새이동경로 파트너십 (EAAFP) 사무국에서 #‎WelcomeWaterbirds‬ 이니셔티브와 2015 ‘세계철새의날(World Migratory Birds Day)’을 맞이하여 철새와 그 서식지 보전을 주제로 누구나 참여 가능한 쌍방향 공공예술 프로젝트 ‘우리의 날개 달린 여행자들에게’를 기획하였습니다. 우리와 함께 살아가고 있는 ‘날개 달린 여행자’ 철새들의 긴 여정이 성공적으로 끝날 수 있도록 여러분이 직접 응원해주세요. 참여 방법으로는 1) EAAFP사무국이 있는 인천 송도 G타워 로비를 방문하셔서 새 모양의 메시지 카드에 응원의 메시지를 직접 적어주세요. 색연필로 그림을 그려주셔도 됩니다. 2) 방문이 어렵다면 ‘우리의 날개 달린 여행자들에게’ 링크http://www.eaaflyway.net/winged-travellers 를 클릭하셔서 여러분의 메시지를 온라인으로 보내주세요. ‘To Our Winged Travellers‘ is an interactive art project that aims to engage the public in a fun and artistic way, to be part of the global celebration of migratory birds, World Migratory Bird Day (WMBD). Anybody can participate in the project by writing a short and sweet message online to our feathered friends with whom we share our environment. Submit your message of support to migratory waterbirds as they travel across the world to their breeding sites. Be part of our interactive art installation and help inspire awe and appreciation of migratory waterbirds. Each of these messages will be printed on bird-shaped notes, which will be hung in their hundreds and thousands (hopefully!) as part of an art installation to be first showcased at the home of the EAAFP Secretariat in June 2015.